Culms: Stiffly erect, usually longer than leaves, sharply triangular, angles very rough above; roots dark brown. Leaves: Up to 7 per culm, narrow, flat, to 1/5 inch wide, ascending to spreading; margins and veins rough; lowest leaves reduced to scales. Sheaths: Tight, closely enveloping culm, green-nerved throughout or inner surface white transparent. Inflorescences: 1/2 to 2 inches long, 1/2 to 1 inch wide; spikes 3-10, crowded or lowest spike separated, egg- to spindle-shaped or nearly spherical, 1/3 to 3/5 inch long, pale green to straw-colored, ascending, sessile, tapering to short points, bisexual; staminate flowers below pistillate; bracts bristle-like or lowest about as long as inflorescence; pistillate scales lanceolate, narrower and shorter than perigynia, tan-transparent, center brown to green, 3-nerved, central nerve lighter; tips gradually tapering to points; perigynia many per spike, flat, to 1/5 inch long, greenish-white, several-nerved; margins winged; beak 1/3 length of body, 2-toothed. Fruits: Achene, lens-shaped, to 1/20 inch long, brown, 1-seeded; stigmas 2, short, tan to reddish. Habitat: Wet open sites; sandy shores of lakes, prairie swales, swamps, wet open woods, wet meadows, and roadside ditches. 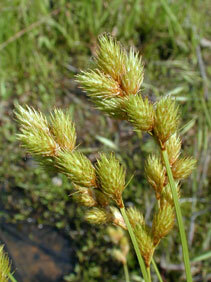 Comments: Wing-fruited sedge grows in dense tufts.